Betty Jane Cooley Clements of Cape Coral, FL and formerly of Franklinville, NY died July 26 with her children at her side after a long, frustrating and courageous battle with Alzheimer's disease. She was a beloved mother, grandmother, and great grandmother. Betty was a kind and caring person, with a quick wit and sense of humor. She loved animals, especially big furry dogs. She was born September 14, 1920 in Buffalo, NY to Henry and Mary Marguerite (Knapp) Cooley. She lived most of her life in Franklinville, NY, graduating from Ten Broeck Academy in 1938. She and her late husband M. Sam Clements were actively involved in ballroom and square dancing and were successful in Tournament Bridge. 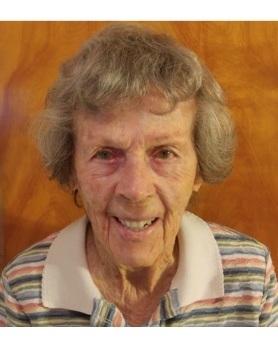 Betty won the Ladies Golf Championship at the Ischua Valley Country Club in Franklinville a number of times and continued to golf into her 80's. She learned to swim at an early age and loved the water. She played the piano, loved to listen to music and sang to the end of her life. After her youngest child entered school she worked at Ten Broeck Academy in various positions, retiring as secretary to the Superintendent of Schools in 1979 at which time she and her husband moved to Ft. Myers, Fl. Living to cherish her memory are her son, Gary Clements of Cape Coral, FL and Caneadea, NY, daughter Susan(Richard) Lawrence of Cape Coral, FL and Plattsburgh, NY; daughter Barbara Fowler of Bath, NY and her grandsons David(Sally) Lawrence of Santa Clara, CA; and Michael(Kylie) Rodrigues of Hector, NY and her great grandsons, Kentaro and Joshiro Lawrence and Theron and Emmett Rodrigues. She was preceded in death by her husband of 60 years, her parents, her brother, William Cooley and nephew Bill Cooley and son-in-law Dr. William Fowler. In lieu of flowers, memorials in her name should be directed to the Alzheimer's Association at N. Michigan Ave., FL 17, Chicago, IL 60601 or Hope Hospice at 2430 Diplomat Pkwy in Cape Coral, FL 33909. Calling hours will be held on Aug. 3, 2018 with family receiving friends from 2:00 p.m.to 4:00 p.m. with service to follow at the Babbitt & Easton Funeral Home. A luncheon will follow the service at the VFW. She will be interred at Mount Prospect Cemetery in Franklinville, NY at a later date.